We are facing an unprecedented global emergency, the planet is in crisis and we are in the midst of a mass extinction event. 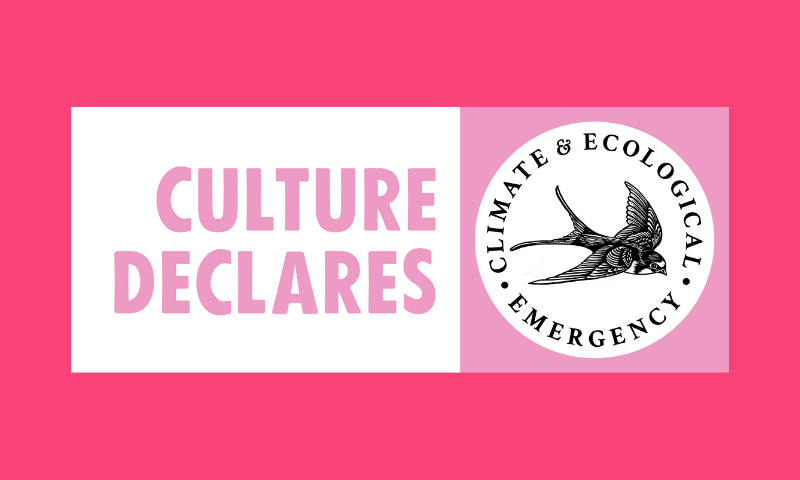 We, Creative Carbon Scotland, join more than 180 arts and cultural institutions and individuals to declare a Climate & Ecological Emergency. We pledge to work with and support our community and local and national governments in tackling this Emergency, and we call on others to do the same. We will communicate with artists, cultural organisations and funding and strategic bodies in the cultural sector and support them to discover and tell the truth about the Emergency and the changes that are needed. We pledge to work towards reducing our emissions to net zero by 2025 and to Scotland becoming a zero-carbon society, well adapted to the unavoidable impacts of the crisis. We will support the cultural sector’s funders, strategic bodies, organisations and individual artists to develop and implement more comprehensive, ambitious and equitable approaches and responses to the climate and ecological emergency. We will challenge policies and actions of local and national governments and their agencies, where we interact with them, that do not help to reduce emissions or consumption levels. We will work with local and national governments, their agencies and others outside the cultural sector to demonstrate and harness the transformational role that arts and culture has in being part of creating the transformational changes necessitated by the emergency. We will actively work to imagine and model ways that our organisation and its work with others can tackle the climate and ecological crisis and regenerate the planet’s resources. We will work to enable dialogue and expression amidst our network of cultural and sustainability strategic bodies, agencies, arts & cultural organisations, individuals and artists about how the Emergency will affect them and the changes that are needed. We believe that all truth-telling, action and democratic work must be underpinned by a commitment to justice based on the awareness of how systems of power combine to multiply the impacts on those who are most marginalised in society*, led by and for marginalised people. Today (3 April) Creative Carbon Scotland joins 180 organisations and practitioners from the cultural sector including The Royal Court, writer Jay Griffiths, director Peter Kosminsky, Jerwood Arts and Invisible Dust in declaring a Climate and Ecological Emergency. Hot Winters, Frozen Springs, Drought Summers, Storms: the very tip of the climate and ecological crisis is just starting to be felt in Scotland and the UK, precursors signalling that our civilisation is on course for abrupt and irreversible devastation. School children are striking at the state of their future, people all over the world are rebelling to avoid extinction and councils are declaring emergency. We must act fast. Humans are capable of responding in a remarkable variety of ways to accelerate climate solutions and adaptations, and culture can help stir up human response, create new stories and visions for our world, bring people together and offer new ways of working to make them a reality. Cultural organisations and practitioners from across the sector are invited to join the movement as Culture Declares Emergency.